This tree is more than 1100 years old. 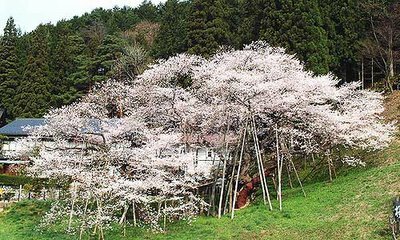 Its stem looks like a dragon crouching on the earth, therefore the name Cherry tree like a crouching dragon, garyuu zakura. It is 20 m high, the branches spred for about 30 meters in diameter. The branches are propped up by dozens of Daliesque crutches. In 1973 it was designated as a Natural Cultural Property. It is located in the compounds of the Temple Daidoo-Ji in Ichi no Miya Village, Takayama Town, Gifu Prefecture. You can see it from the local train station. 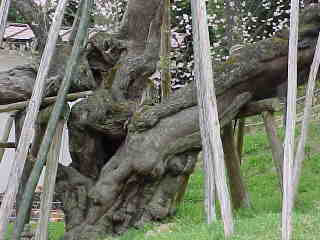 An example of Edohigan Cherry Tree (Prunus pendula form. ascendens), the symbol of Japan. 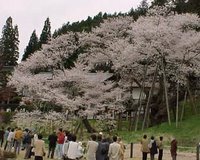 In 1931, it was named after the lying Dragon, before that, it was named the "Large Cherry Tree of Daidoo-Ji Temple". The flowering time is the middle of April. Copyright © 2005 Gifu Prefectural Government.